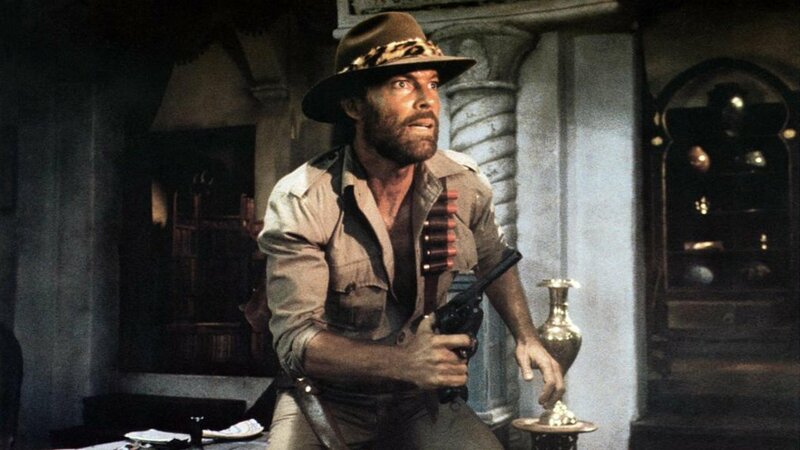 Back in March of 2015, Olive Films released the 1987 Cannon adventure "classic" Allen Quatermaine and the Lost City of Gold on Blu-ray for the first time. It is the sequel to King Solomon's Mines, which was released in 1985 and is directed by Cannon staple J. Lee Thompson. For whatever reason, the HD releases of the two films were switched, which means two years later we're finally getting King Solomon's Mines on Blu-ray despite it being the first of the two films. A cause to celebrate? I mean, maybe, if you're as much of a Cannon completist as I am. The rest of you can probably go about your lives. Based on the series of adventures created by H. Rider Haggard back in 1885 and previously adapated to the screen in 1950, King Solomon's Mines casts Richard Chamberlain as Haggard's heroic Allan Quatermain, adventurer extraordinaire hired by Jesse Huston (Sharon Stone) to find her father, who went missing while looking for the fabled King Solomon's mines. It turns out he has been captured by the German military and a fellow fortune hunter by the name of Dogati (John Rhys-Davies), who want Jesse's father to interpret a map leading to the mines. Everything from the casting of John Rhys-Davies to the the dual villains of German military and a fellow fortune hunter (aka Belloq) is extremely reminiscent of Raiders of the Lost Ark. That's not an accident. Spielberg and George Lucas were clearly influenced by the writing of H. Rider Haggard in creating Indiana Jones, just as Menahem Golan and Yoram Globus, the head honchos at Cannon Films, were clearly attempting to replicate the success of Raiders and Indiana Jones and the Temple of Doom in launching their own adventure franchise. 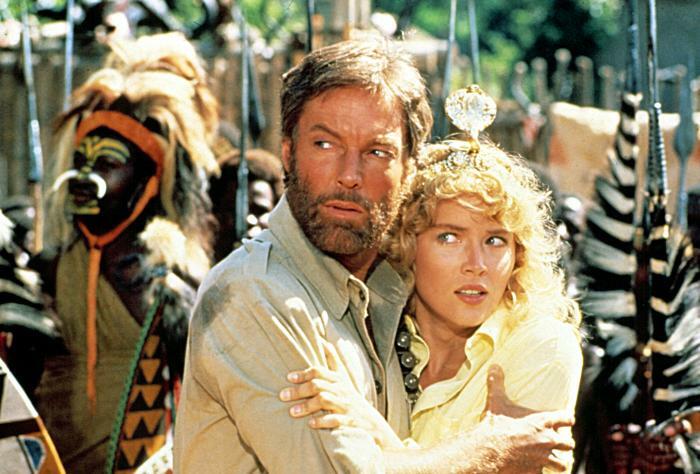 Their two Allan Quatermain films, shot back to back but released two years apart, are the knock-off brand Indiana Jones -- an imitation that lacks the money, resources and, dare I say, talent to pull off something that can touch Spielberg's adventure classics. Which is not to say there isn't fun to be had, particularly if you're a student of Cannon (and all '80s exploitation) like I am. There's a low-tech charm to the way Cannon strives for big-budget scale in some of their more ambitious efforts, a category in which I would include both King Solomon's Mines and its sequel. There are underground volcanoes and giant underwater monsters. There is an alligator pit and there is quicksand. There are armies and African tribes (which reminds me, this movie is really racist even by the standards of a 1985 adaptation of 1800s literature). Cannon was thinking big with their Quatermain films, which makes the sequences where they had to cut corners stand out all the more. There is a long -- and I mean loooong -- airplane escape that cuts between passably-shot stunt footage and some pretty terrible rear projection close-ups. I don't typically mind that sort of thing, as I enjoy the cheap handmade charm of those effects; the degree to which King Solomon's Mines relies on those shots and lingers on them calls to much attention to them and underscores just what an uninteresting action sequence it is. You can only get by trying to generate visceral excitement out of reaction shots for so long. The overall stiffness to the action isn't helped by the performance of Richard Chamberlain, who does his best but can't escape the fact that his version of Indiana Jones couldn't even make the JV squad. There are actors able to convey roguish charm -- Harrison Ford had it (obviously), Michael Douglas had it in Romancing the Stone, Tom Selleck had it in High Road to China, even Brendan Fraser had it in The Mummy (1999) -- but Chamberlain is better suited for soaps and melodrama than Saturday Afternoon Adventure. He's doing an impression of a matinee idol in air quotes and it's the wrong approach, as this kind of character should feel more effortless. His chemistry with co-star Sharon Stone is pretty thin, possibly because she's cornered into playing a generic damsel in distress and can't display any of the strength that would make her a star and possibly because the two of them reportedly couldn't stand one another. 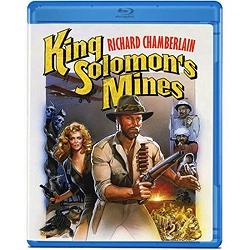 The completist in me is thrilled to have King Solomon's Mines on Blu-ray, where it can now sit alongside Allan Quatermain and the Lost City of Gold and get dusted off whenever I feel like some cheap, dopey adventure. Sure, I usually feel like watching Raiders or Temple of Doom just like I usually feel like ordering pizza from one of the good places around us. But sometimes I feel like eating Pizza Hut, too. Days like that are what King Solomon's Mines are made for. Buy King Solomon's Mines from Olive Films here. I use to watch these two movies with my Grandmother who was a big Chamberlain fan because of the TV Series "Shogun" which she also taped and watched over and over (the TV movie, not the entire series). She would laugh a lot at these films which was infectious and would have me laughing to tears. In retrospect, it probably wasn't the movie but laughing because my Grandmother was enjoying it so much so I always equate the two films with very happy memories! Side note: when my Brother and I upgraded to the Super Nintendo, we had our old Nintendo in the basement of my Grandparents house in which we spent half of our time as kids. During the day, my Grandmother would tape her soap operas and play The Legend of Zelda during the roughly 4-5 hours a day of her taping these soaps. She would literally beat the game, then start is all over again. This lasted for years, into my teens! Never played any other game, only Zelda. She also became a big WWF fan, even subscribing to RAW and SMACKDOWN Magazine and this lasted until she passed away about 10 years ago. She was super wacky and I loved it! Thanks for the memories! It does sound like she was unique and wacky. Thanks man! Yeah, great times! i've been waiting for this one. i heard Lost City of Gold was not great and this one was very fun.